Fabric art has SO many possibilities. Our community members are always coming up with creative ideas, and sometimes they want to know beforehand whether their inspiration is going to work! I have answered many of the common questions here (and a few uncommon ones), but if you come up with something that’s not on this page, click here to send us your question! Click on question to reveal answer; click again to close. Q: What are the “blender” sticks and how do I use them? There are two blenders, the Colorless Blender and the Iridescent Blender. Blenders are made from paint medium, but have no pigment. The Iridescent Blender has the “shiny stuff” that makes it iridescent, but no pigment to give it a true color. Blenders are know as “extenders” in the paint world. By mixing a lot of blender with a small amount of color, you can get a pale version of that color. Caution!The Colorless Blender will turn from clear to yellow over a couple of years. I have seen this in my own samples and it has been reported by a number of people who used the colorless blender on art cloth and art quilt projects. I have stopped using the colorless blender in my own work and don’t recommend it for use on fabric – unless you are specifically looking for a way to make an image look “aged” over time. I have not seen “yellowing” problems with the Iridescent Blender. If I need to use a blender, I always use the iridescent blender – and leave the colorless blender alone. Q: Are the paintstiks really “odor-free” like it says on the package? Not according to my sensitive nose! (said with a big smile) The paint manufacturer calls the paintstiks “no odor” but I disagree. I call them “low odor.” They smell like a combination of wax and oil paint, but the smell is very light compared to a traditional oil paint. I notice more of an odor as the paints are drying than when I am painting. It’s not obnoxious, but it’s there. Some people notice a residual odor in scarves / garments. It depends on how sensitive your nose is. One of my best customers successfully removes the leftover smell by gently washing her fabric with Fabreeze for the Wash. If you are particularly sensitive to chemical odors, I suggest purchasing one or two colors and experimenting with them to see if it’s a product you can work with. As with any product, there’s no sense making a big investment only to find out you are too sensitive to the smell to enjoy using it. Q: Can I use my paintstiks on other surfaces like metal, paper, and wood? Q: Can fabric colored with paintstiks be framed under glass or acrylic, or does the glass need to be left off as in an oil painting? I am not an art conservator, but there are some common sense things you can do here. If you want to put the fabric under glass or acrylic, I would use a shadow-box approach or at least a spacer between the glass and the fabric. I don’t think you want the painted fabric touching the glass. I would personally wait at least 6-8 weeks for the paint to dry before framing a piece. Paintstik oil colors are oil-based paints and they take longer to dry than water-based paints. Better safe than sorry. For a definitive answer to this question, I would contact the art department at a local college or university or consult with someone at an art gallery that handles oil paintings. 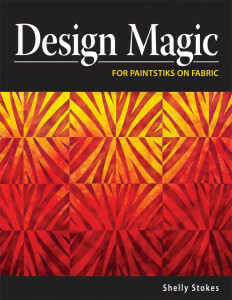 Q: Can I use paintstik colors on all types of fabric? Does it matter if they are cellulose fibers or protein fibers? What about synthetics? Fiber content is not going to be an issue with paints. When you dye a fabric, a chemical bond forms between the dye molecules and the fibers. That’s why you need certain dyes for cellulose fibers (cotton, linen, rayon) and different dyes for protein fibers. When you paint a fabric, the bond is strictly mechanical. The paint adheres to the surface of the fibers rather than forming a chemical bond. The only fabrics I know to watch out for are those that have been chemically treated to be stain resistant. If the fabric is stain-resistant, it may also be paint-resistant. Keep in mind that almost all fabric coming into the stores is treated with finishes when it is manufactured. That is why we recommend pre-washing fabric before painting it. Use a plain detergent when pre-washing fabric and do not use fabric softener. With that single step, you should be ready to paint. Q: How much fabric can I paint with one paintstik? A lot! 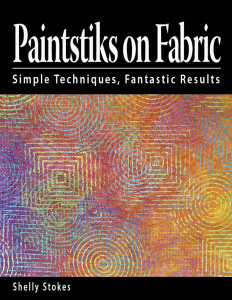 According to one of my garment-sewing friends, you can cover 2 to 2½ yards of fabric with light rubbings before you completely use up one full size paintstik. Q: How long will Paintstiks last? Paintstiks have a very long shelf life. According to the factory, they will begin to dry out 2 years after they are manufactured. I have some paintstik colors that I acquired over 10 years ago. The skin is thicker, but there is still good paint in the middle of the stick. Q: I’m teaching a one-day class to kids 8 to 14 years old. Is there any way to heat set rubbings faster? Does it help to set them in hot sun? What about using a heat gun or hair dryer??? I hate to be the bearer of bad news, but rubbings simply take longer to dry. I don’t know of any way to make them dry quickly. If the rubbings are light (which I don’t expect if you are working with kids) AND made with IRIDESCENT colors, you can turn them paint side down on baking parchment and heat set with an iron right away. The paint won’t be totally dry, but a film will form over the top. If the person making the rubbing has a heavy hand (most of us to begin with and most kids), there is simply too much paint to have much luck with quick heat setting. If you are working with MATTE colors, be very cautious about trying to heat set the paint without at least 24 hours of dry time. Several of my experienced customers have had problems with discoloration when they tried to push the heat setting too quickly with matte colors. You might try a heat gun (not a hair dryer) on a few samples and see if you have any luck getting the paints to film over without discoloring. Definitely test before you plan on using this for your class. If all else fails, lay a piece of muslin or paper towels over the painted fabric, gently roll or fold it up, and send it home with instructions to set it aside for at least a week. If these are not going to be washed, they don’t actually need to be heat set. The paint will dry on its own over time. 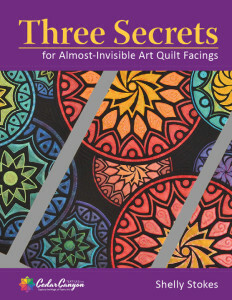 Q: Do I have to heat set my fabric for art quilts? If you are creating fabric for a wall hanging, there is technically no need to heat set the paint. Jut let the paint dry on it’s own time and it will be fine. Heat setting speeds up the end of the drying process and is recommended for anything that will be washed, but there is no compelling reason to heat set fabric that will be used in wall hangings. Q: How do I heat set paintstik colors? In the clothes dryer: After the paint has cured for the appropriate number of days (see question above), put the fabric in a clothes dryer at the hottest setting for 30-45 minutes. Do NOT put freshly painted fabric in the dryer – and if you do, don’t call me! Q: How long does it take paintstik colors to dry? Stenciled images will be dry and ready to heat set within 24 hours (unless you used a very heavy application of paint). Rubbings (and any direct application technique) take longer to dry. Allow 3-5 days for the paint to dry. I allow 7 days if I make several layers of rubbings – or during humid times of the year. Test the paint by rubbing your finger over a section of paint. If you see paint on your finger, it’s not dry yet. Set the fabric aside for another day. Once you no longer pick paint up with your finger, it’s ready to heat set. Q: Are paintstik colors permanent / washable? Yes! After you apply paintstik color to fabric, you need to let it air dry, and then heat set the paint with an iron or in a clothes dryer. After the paint has been heat set, your fabric is washable. Note: Do NOT dry clean fabric decorated with paintstik colors. Dry cleaning fluid is a solvent and it will dissolve the paintstik colors (which are oil-based – not water-based paints). Q: How should I store my paintstik colors? The film on the outside of the paintstik automatically re-forms within a day after you use them. The film keeps the paintstiks from drying out over time. Simply store them in a plastic bag, a plastic box, or whatever you have handy that will keep them separated from your other supplies. Q: I bought new paintstiks, but nothing happens when I try to use them. What’s wrong with them? Not a thing! Paintstiks have a film over the outside of the stick. Peel the film away with a vegetable peeler or a small paring knife to expose the soft paint underneath. Q: I had my rubbing plates in the back of my hot car, but now they have lost their shape. What happened? Over exposure to heat or intense sunlight can be a problem. If the rubbing plates get warm enough, the designs will “melt” away or become mis-shapen. Q: Can I usemy rubbing plates as a mold for UTEE hot wax? No. The rubbing plates are created with a thermo-forming process. The plates will lose their shape if you use them with hot materials such as melted wax. Q: Can I use my rubbing plates for things other than paintstik rubbings? 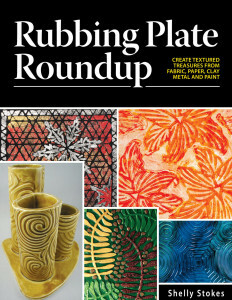 Let me count the ways… Check out the Rubbing Plate Roundup book for a dozen techniques for creating textured treasures with rubbing plates and fabric, paper, clay, metal and paint. You’ll find ideas for using rubbing plates as a stamp, as a mold and as a rubbing plate (of course!). Q: Can I trim the edges off my rubbing plates or cut them into several pieces? Yes, you can cut rubbing plates apart quite easily. A while back, I was doing some mono-printing with a gelatin plate and had trouble with the edges of a rubbing plate making marks where I didn’t want them. I simply trimmed the edges off and had much better results. You can cut a rubbing plate into multiple pieces with a standard pair of scissors. You can always lay the pieces on a sticky mat (Grip-n-Grip mat) next to each other if you want to make a rubbing from the entire image. Q: How big are the rubbing plates? Rubbing plates are 7” square. The design surface of each plate is 6 ½” square. Q: Can I use both sides of my rubbing plates? Of course! (You can do whatever you want!) I always check both sides of a rubbing plate to see which side I like better. Sometimes I like the back side better than the “right” side! Q: How do I keep my paintstik from dipping down into large openings in my rubbing plates? Q: I’m making rubbings, but it’s difficult to get a clean image. 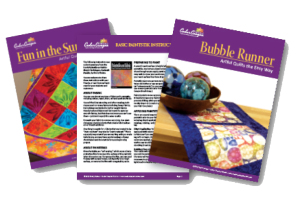 How can I keep my fabric from slipping while I am making rubbings? Here’s Secret Weapon #2… Spray the top of your rubbing plate with a repositionable adhesive. (I call these sprays “Post-it Notes in a Can” because that’s exactly how they work.) Let the adhesive dry for a minute or two and then proceed to make the rubbings. The adhesive keeps your fabric from sliding around on the rubbing plate. I recommend 404 from Spray and Fix and KK2000 from Sulky. Some of the basting spray products are too gummy, so make sure you test any adhesive before applying it to a bunch of rubbing plates. Q: Is there a way to keep my rubbing plates from sliding around without taping them to my table? Q: I am using freezer paper stencils, and some of the images have to overlap. After I have painted the first image, can I overlap the second image and press it down immediately? Or do I have to wait a period of time before pressing down the second stencil? You can press your second freezer paper stencil on the fabric right away and continue to work. Just put a piece of plain paper over the stencil to keep any paint off your iron. When you work “wet” (without waiting for the paint to dry) you may see some blending of colors as you apply paint with each subsequent stencil or image. If you do not want any blending, wait 24 hours between images. You can also use a heat gun or embossing tool to get a film to form on top of your paint quickly. (A hair dryer probably is not hot enough.) I would reserve the heat-gun method for cotton and natural fabrics as synthetics will probably melt. Q: What can I spray on the back of a plastic stencil to make it stick to the fabric? I want something that doesn’t leave a residue. I call these sprays “Post-it Notes in a Can” because that’s exactly how they work. The spray keeps the stencils from moving on the fabric. The spray stays on the stencils and does not leave a residue on your fabric. Pretty neat. Q: Is there a way to keep my fabric from moving around without taping it down? You can find Grip-n-Grip mats in our Online Store. If you don’t already have one, you should definitely add one to your next order. You’ll wonder what you ever did without it! Q: How do I clean my stencils? 1. Wipe the stencils as you work. I keep a piece of scrap fabric or paper towels handy. After I paint an image, I put the stencil on the scrap fabric and gently wipe the paint off with another piece of fabric or a paper towel. I wipe both sides as I often have just a little bit of paint that gets under the edges of the stencil openings. 2. Mist the stencil with a solvent and wipe with a paper towel. This is very useful if you have paint buildup on the stencil. I don’t care for most solvents, so I use something like CitraSolv,a concentrated orange-based cleaner. I put the CitraSolv in a small spray-pump bottle and spritz it onto the stencil. 3. Clean with Cedar Canyon Brush Soap. Scoop some brush soap out of the jar and smear it on the stencil. Remove the soap with a damp cloth or paper towel. Works like a charm, and is totally non-toxic. (And don’t forget that the brush soap is a great hand cleaner!) You can find our handy dandy brush soap over in the Online Store. Q: How do I remove the sticky spray from my stencils and rubbing plates? All the companies that make sticky spray also make sticky spray remover. They work very well, but I find the removal products have a very strong chemical odor and need to be used in a well-ventilated area so I don’t conk out from the fumes. For a more environmentally friendly solution, my favorite cleaner for stencils is Citra-Solv. It’s a very concentrated orange-based solvent that I find in the local natural foods store. Citra-Solv works like a champ and simply smells like oranges. Q: How do I use your Cedar Canyon Brush Soap? There are no instructions on the package. Oops! I’ve cleaned so many stencil brushes that I didn’t even think about instructions. We’ll have to see if we can come up with something short and sweet that will fit on the label. At any rate, here is my method for using the brush soap. Dip your brush into the brush soap. Rub the brush soap into the bristles. I rub the bristles in a circular, scrubbing motion in the palm of my free hand. Once you have worked the brush soap thoroughly through the bristles, rinse the soap from the brush under warm, running water. It may take more than one application of soap if there is a lot of paint in the brush. Remove excess water with a towel and allow the brushes to dry before using them again. Paintstik color will often stain the brushes, so the brush may not return to its original color after it is washed. The only product I have found that will completely remove the stains is homemade lye soap — a gift from one of my students. Your brush may be clean, but still discolored.